This volume provides students an introduction to the science of biology. 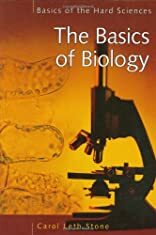 It details the history of biology, as well as many of the field's basic theories and concepts for students. It demonstrates the modern tools and techniques that biologists use today. The book presents the most noteworthy discoveries in biology, including those that affect our daily lives, and easy experiments are provided for students to replicate for biology assignments or their own personal study. This volume is part of a four-volume series on the Basics of Hard Sciences. These volumes-Earth Science, Biology, Chemistry, and Physics-will teach high school and college students everything they need to know to prepare research papers and classroom projects. About Carol Leth Stone (Author) : Carol Leth Stone is a published author. Published credits of Carol Leth Stone include The Basics of Biology (Basics of the Hard Sciences).